Welcome to The GROUND Up, our monthly newsletter where we wrestle the cultural zeitgeist to bring you our highlights from the world of social, sport, entertainment and tech. Home GROUND: Who runs the world? LADs. Hot off the press, media publisher LADbible Group have purchased their previous main competitor, UNILAD Group. LADbible stepped in as a buyer following UNILAD falling into administration earlier this month. The purchase not only safeguards over 200 people working on the UNILAD business, but now creates the world’s largest social video publisher. The combined publishers have a following of over 120 million across their social channels and to help put this into context in August alone their videos were viewed 4.5 billion times. Top lads. Pizza being delivered by a drone to your doorstep after a big night out might feel lifesaving at the time, but the reality is, there hasn't been any real 'drones for good’ work of note. The early promises of a drone-led world have been yet to materialise...until now. Enter start-up company, Zipline who have made a deal with the government of Rwanda to use small, autonomous planes to deliver much needed medical supplies to rural communities across the African country. Could this life-saving mode of delivery be the breakthrough that opens up regulators to accept drone delivery? Let’s all hope they can deliver. 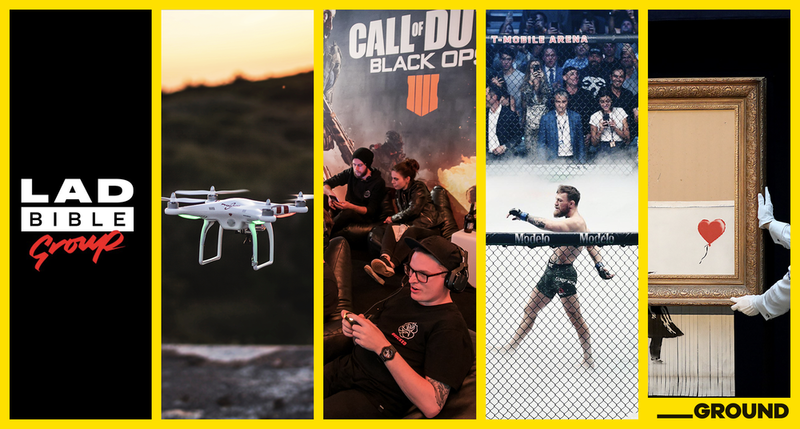 This month’s mission was the launch of our client, Activision’s title, Call of Duty: Black Ops 4. The GROUND team were tasked with creating the franchise’s first-ever ANZ battle royale livestream event. We put Australia’s biggest Twitch streamers, musicians and athletes, into an epic online battle royale game to celebrate the title’s new ‘Blackout’ mode. The stream was a huge success (check out our hype reel of the event here), but importantly Call of Duty: Black Ops 4 broke the day one digital sales record. Fancy yourself as a decent Black Operative? Send us your PSN ID and we can tee up a game. Sports GROUND: UFC - Unbelievable. Freaking. Controversy. MMA fan or not, we’re guessing that you heard about a fight this month at UFC229 in Las Vegas. The grudge match between Khabib Nurmagomedov and Conor McGregor broke the UFC’s Pay-Per-View record by over 800,000 buys and acted as an extremely successful press run for McGregor’s own ‘Proper Twelve’ whiskey(resulting in Irish stores having to limit the product to 2 bottles per customer in order to keep it on the shelves). The fight was surrounded by controversy before and even more-so after, with religion, politics and even an appearance from Drake helping to fuel the fire between the athletes. Khabib not only won the fight but took it out of thecage as well (and lived up to his Eagle nickname) by jumping out and attacking McGregor’s team of coaches. Probably not the best look for the brand... but the buzz around the event has opened up the sport to an even wider audience – cue Khabib challenging Floyd Mayweather…and so the circus begins. Street artist Banksy put together one of the best pranks of the 21st Century when his 2006 artwork titled ‘Girl With Balloon’ self-destructed instantly after being sold at an auction for $1.7 million via a built-in shredder attached to the artwork’s frame. Banksy’s authentication body, ‘Pest Control’, re-authenticated the 2006 piece and even renamed the work ‘Love Is In The Bin (2018)’. The new artwork is now valued at more than double the auction price. Some people have even reportedly taken thecopycat approach and shredded their own $70,000 Banksy prints, which would you believe it, has seen the value diminish instantly. As always, Banksy is having the last laugh here, as let's not forget one of his previous works depicted a crowd at an auction, with a framed artwork saying, ‘I can’t believe you morons actually buy this sh*t’.